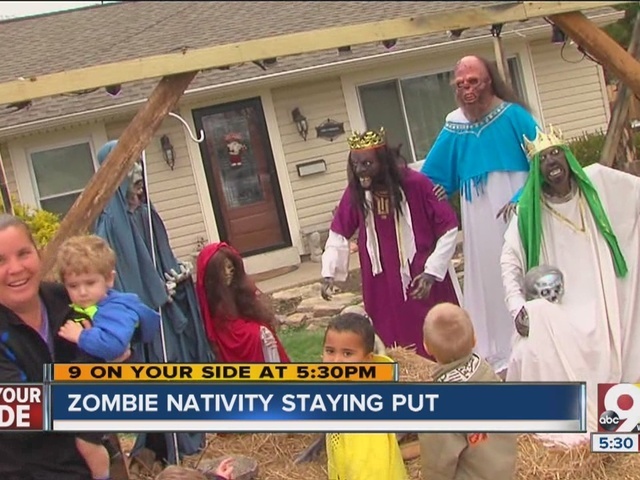 SYCAMORE TOWNSHIP, Ohio -- After causing an uproar last year a zombie nativity scene -- featuring an undead baby Jesus, Mary, Joseph and wise men -- is allowed to stay on display without penalty, according to Sycamore Township officials. After initial threats from Sycamore Township officials for a $500 per day fine if the display went up, now the nativity is apparently in compliance with township zoning laws after owner Justen Dixon took the roof off the manger. "This was never about the zombies," said township zoning administrator Harry Holbert, "but rather that the manger was 15-feet high." Last Christmas, Dixon applied for a building permit, raised almost $1,000 for supplies, created a Facebook page for the zombie nativity and garnered national media attention -- the New York Times, Washington Post and Vice among them. Headlines ranged from " Zombie nativity too scary for this Ohio town " to " Ohio man honors the true meaning of Zombie Christmas ." Dixon put up the display the day after Thanksgiving last year, but he took it down before he was cited by the township. He did not have to pay any fines. Last year's citation was due to "numerous violations for debris" and the size and location of the display, Holbert said. Holbert said Dixon's nativity scene could be considered an accessory structure and accessory structures can't be built in the front of a house. On Dec. 2, the Zombie nativity scene Facebook page posted a copy of a letter from Holbert informing him that his application was denied. But the scene is still up on Wednesday, a full week after Dixon's application was denied by the township. Dixon could be fined up to $500 for every day the structure stays up, Holbert said. The denial letter from Holbert didn't specifically mention and fines. According to a later post, Dixon will be fined for the display starting Dec. 4. On the Facebook page, Dixon is asking for supporters to contact Holbert. He's also raising money through generosity.com to cover "legal fees that the township of sycamore is trying to threaten us with." So far, the account has raised more than $2,500. Please, take one minute outta your busy day and voice your opinion. The nativity scene also held a fundraiser for St. Jude's Children's Research Hospital, according to their Facebook page. Stop by for a free sticker, with a two dollar Saint Jude donation.? But after Dixon elected to take the roof off the display's manger scene earlier this week, Holbert said the scene could stay and was no longer in violation of zoning laws. Holbert said he received "hate mail" from supporters of the nativity scene. While the nativity scene has a seemingly large fanbase -- complete with novelty T-shirts for sale -- people from Deer Park and beyond are up in arms about the display and comment on the group's Facebook page to share their thoughts. "This is not funny and the worst of all is that there are folks that not only participate on this but encourage it," Facebook user Fam Quintanilla Brunner wrote on the page. "That's why God's eyes have turned away from our country." "Disgusting. You will read what you sow," wrote Sheila Guy. To which the Zombie nativity scene account replied with the "smiling imp" emoji. Others, however, say they don't like the display but they think it should stay up. "I absolutely HATE the nativity scene. But it is your right to do as you wish," Laura Ann wrote on the Facebook page. "I hope this goes to court and you win. Total waste of taxpayers money because someone just can't drive by and look at the other side of the street or look at the actual road!" Dan Fluker's automotive shop is across the street from the zombie nativity scene. Fluker said he considers himself a religious man, but he doesn't mind the zombie baby jesus across the way. “Knowing Jasen, that’s just the way he is,” Fluker said. “I know people had their difference of opinion, but like I said, it surprised me but it didn’t offend me at all, no." Other Facebook fans are commenting on possible selective enforcement by Sycamore Township, noting that other "traditional" nativity scenes are up in the township with no issue. Hey everyone, look what Sycamore Township is letting go up in Bechtold park, less than a block away from mine?? Dixon said this will be the last year for the nativity scene, though.